Casa de Los Suenos is a 7000Sq.Ft. three story, three bedroom masterpiece of indoor/outdoor living. This is our year round home and has been for 6 years. 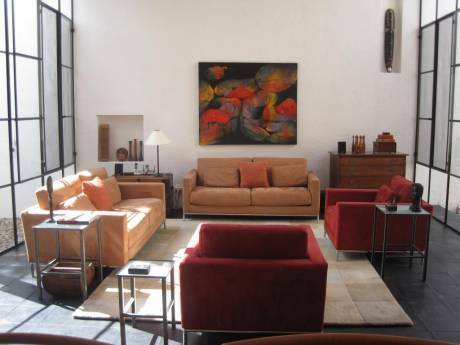 It is furnished with every luxury and detail that will assure you of a grand vacation. We have a service staff of three who will cook, clean and launder to perfection. They serve from 9-4 each day and half day on Saturdays. Our home is in a perfect location from the center of town and all the culture and shopping you crave. There are three covered outdoor living and dining areas as well as indoor living and dining. The courtyard is filled with lovely olive trees and flowers as well as native flowering cactus. The house is stone and cantera and since we have a perfect climate, we need no heat or air conditioning. The sun shines every day. We have collected beautiful art and antiques for you to enjoy as well as two large blue ray screens for movies and TV. We have a well stocked library with titles from history to romance. There are two vonage phones and two local lines as well as wireless internet throughout the house. There is a stereo system with speakers in every room and many CD's for your music pleasure. The house is light and airy and nature is enjoyed from each room. It is like living in the country with the city outside your door, allowing you to walk everywhere. 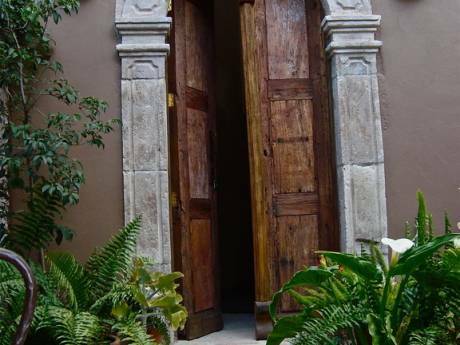 The house is surrounded by a 20ft stone wall allowing you to enjoy the gardens and courtyard in total privacy as is the Spanish custom. My husband and I retired here from the East Coast of the U.S. about 6 years ago. We were looking for a place that was not only beautiful, but had near perfect weather year round, and provided an opportunity to have full time help in the home. We came one time and sold everything and moved to San Miguel. Graeme is a retired attorney and investment banker and I was a holistic practitioner and nurse. Graeme is involved in helping those who are considering moving to Mexico by providing much needed information on how life works here in paradise. He is also involved in the art community and owns a sizable collection of local art. I have studied Spanish, art and many crafts as well as maintaining a daily exercise routine and reading and writing my memoir. Helping with the local charities started by the expat community is a part time activity of a majority of the community. Please note, we are willing to travel anytime of the year. We are very flexible. 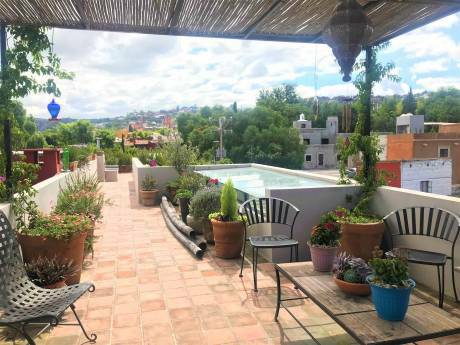 Located in the Centro or old town of San Miguel de Allende in a mixed neighborhood of Americans, French, English and Mexicans, our home is perfectly located for strolling and exploring. The streets are cobbled and the sidewalks narrow and of stone. This is a UNESCO World Heritage Site and San Miguel appears much as it was 200 years ago. Within a few blocks are galleries, museums, and shopping as well as beautiful parks for people watching or chatting with the locals. The healing mineral hot springs are a 15 minute drive, Mexico City with its pyramids and ancient aztec ruins is a 21/2 hour ride. We are 6000 ft up in the mountains of central Mexico in a very safe and tranquil town. There are 10,000 expats in our community since Americans and Europeans started coming here to live in the late 30's. San Miguel has more celebrations and colorful rituals than any other town in Mexico. The Jardin or public park is just 4 blocks away and tango and concerts and dance are weekly or biweekly events. Life is colorful, interesting and very friendly and life is lived every day to the fullest.